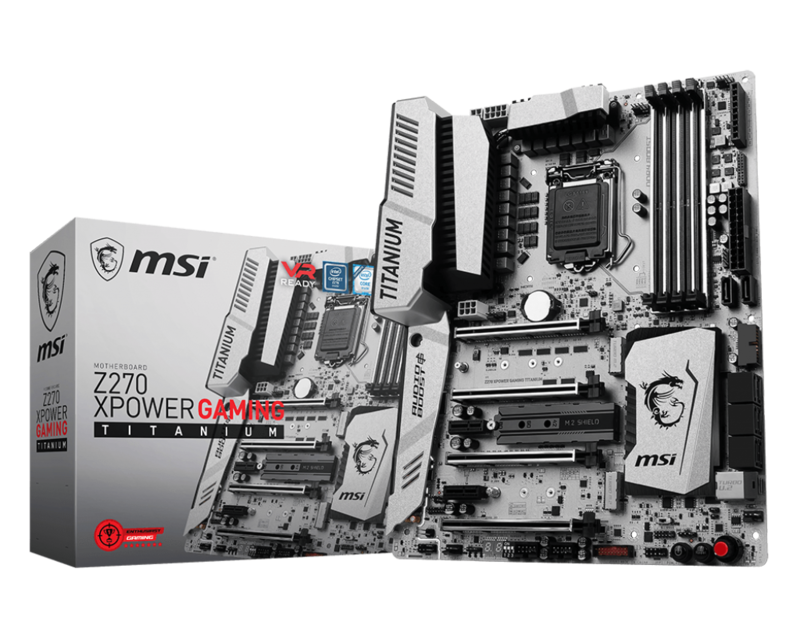 If you are concerned about performance, the MSI Z270 XPower Gaming Titanium stands up with the best of the motherboards. As we have seen time and time again, when it comes to the performance of the motherboards there is usually just a small difference. What matters more is the quality of the components, and the added features. Some motherboards are setting themselves apart by integrating lots of RGB LED options, the MSI Z270 XPower Gaming Titanium, keeps it’s onboard LEDs to a minimum, and mostly as system indicators only. However, they have include a Mystic Light RGB LED strip header on the motherboard for those that want to use RGB LED strips to light up their system. A couple of standout features on the MSI Z270 XPower Gaming Titanium is the Game Boost knob on the motherboard. With it, you do not need to enter the UEFI to change your overclock, there are preset configuration you can select just by dialing it in. 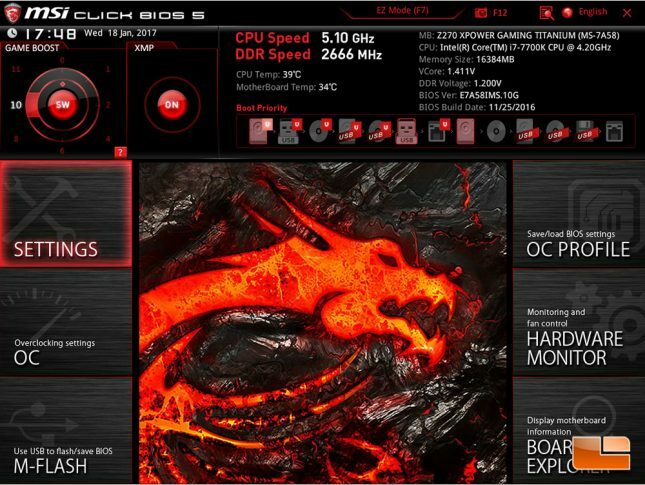 You also have the option of using the OC Dashboard, Windows software or the UEFI to do your overclocking. MSI doesn’t limit you to one or two methods, they have made sure that no matter how you want to overclock, the options are there. Plus if you happen to need to reset the UEFI, there are several methods to reset the UEFI, along with an external clear button on the rear I/O panel. Overclocking, is one place that the MSI Z270 XPower Gaming Titanium took a stand away from the other motherboards we have tested. In both CPU and memory overclocking, it went beyond our previous limitations. The CPU we have only been able to get a stable 5.0GHz, with a bootable but unstable 5.1GHz. The XPower Gaming Titanium, we were able to get a stable 5.1GHz, and an unstable 5.2GHz. While the memory went from a previous limitation of 3000MHz up to 3100MHz. We believe that both the CPU and memory overclock are the hardware limitations, however that doesn’t stop us from trying to break through those barriers. There are only a few things that I’d like to see MSI take a closer look at. First, the M.2 Shield should be included on all three M.2 ports, not just one. The price of M.2 PCIe NVMe drives are dropping and you can pick up a 480GB model for under $200 now. That means people are more likely going to have more than one. 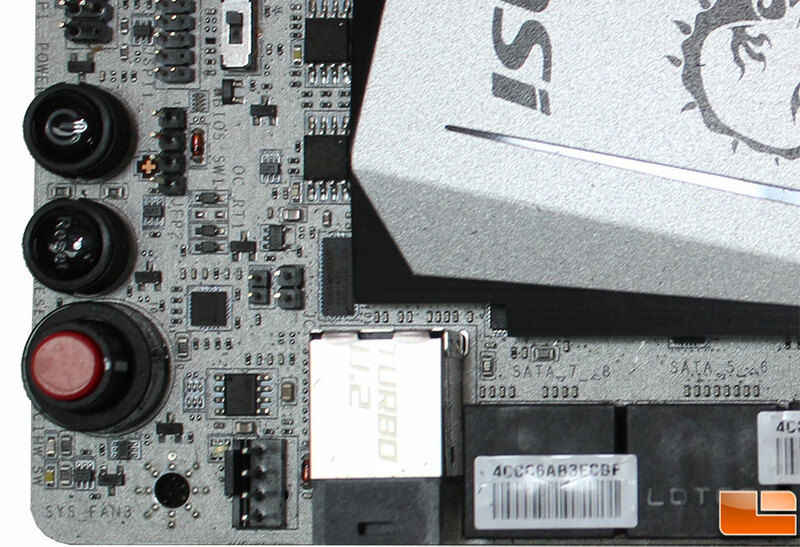 Next, is purely a personal preference, is the USB 3.0 header that is horizontal to the motherboard, I can see the reason for this however I personally don’t care for it in that orientation due to the rigidness of the USB 3.0 front panel cable. The MSI Z270 XPower Gaming Titanium comes with a high price tag of $329.99 with free shipping. For that you are getting an extremely feature rich motherboard that supports the latest Intel Kaby Lake processors, along with all of the latest storage and enthusiast features available. Legit Bottom Line: The MSI Z270 XPower Gaming Titanium looks great, and runs great. For novices the overclocking features make it extremely easy to squeeze extra performance out of your system. For experts, the overclocking features are designed for you to be able to push the system to its limit.